February 29 only comes every 4 years, which is why I’m taking this opportunity to show you how to make PERFECT FRIES ! *and pay careful attention, because I’ll only do this type of recipe/technique for you, only once every 4 years. And I’m not talking about the skinny fries you can get at McDonalds, but the thicker-cut ones you can make at home. But be warned, several steps are required, but some steps will allow you to make them ahead of time, in order to refrigerate and/or freeze them before the final frying. I began the experiments exactly 4 months ago, and then repeated the experiments several times until it became natural to me, no longer requiring measurements or any particular precision. When I realized the special date today, it was time to share it with you. 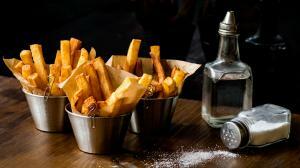 There are several approaches and each will provide you with tasty fries, but not necessarily the right texture, unless you have particular instruments and ingredients (I’m talking about cooking thermometers or real fryers or even beef fat). I do have a fryer now and thermometers and special fats but it was important for me to stay simple or at least provide a simple solution, using regular oil, regular potatoes a frying pan (a wok is best) and your sharp eyes and judgement. I experimented with 3 methods : the 1st and best method (number 1 in the photos) consists of peeling then slicing the potatoes, then boiling, then frying, then re-frying. 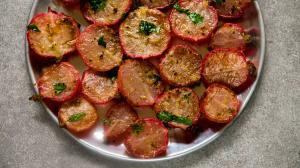 the 2nd method consists of peeling, soaking for 6-8 hours, then slicing and soaking for 6-8 hours more, then frying, then re-frying and the 3rd method consists of peeling, just rinsing, then slicing (no rinsing or soaking again), then frying in (beef fat), then re-frying. Either way, several steps are always needed, but the 1st version also allows you to make them ahead of time, which is definitely a big PLUS. It also provides the tenderest inside and the crunchiest and firmest outside (you can definitely see the difference in the photos). p.s. : in Montreal, we love slightly soggier fries in a brown paper bag with salt & vinegar !